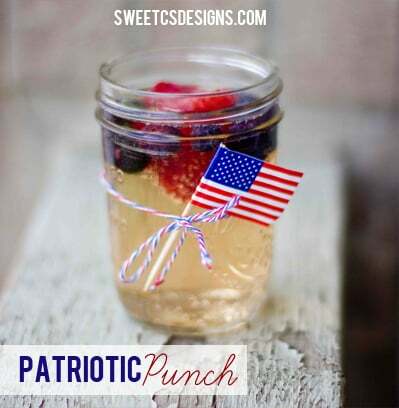 Delicious easy Red White and Blue Fruit Patriotic Punch is the perfect party drink for the 4th of July – with red, white, and blue fruit that will be the hit of any party or picnic! When I first posted this recipe over 5 years ago, I knew it would become one of my favorite easy party drinks – and it’s one I love to make every summer to this day! This delicious easy punch is great to make ahead of time so the fruit juice comes together – it’s great for big 4th of July parties! Its totally easy to make, and if you want an adult version you can dump in a bottle of your favorite wine (or booze). Best of all, I am using frozen fruit so your drink wont get all diluted and it will stay nice and cold during a scorching hot day. 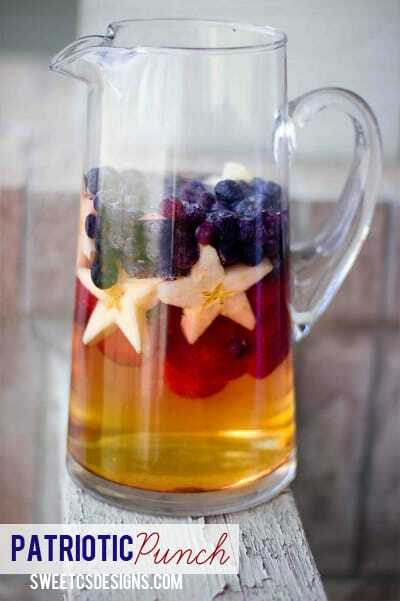 JUST TAKE ME TO THE RED WHITE AND BLUE FRUIT PATRIOTIC PUNCH RECIPE ALREADY! If you’d rather skip my (very helpful, i think) tips and tricks and get straight to this deliciously easy 4th of July Punch Recipe – simply scroll to the bottom of the page where you can find the printable recipe card. To make this an adult version, add a bottle of wine, or some tequila, vodka or rum. Just be warned- fruit soaks up alcohol. Don’t go eating tons of fruit! Add 2 cups tequila and stir well. With your apple stars cut, add frozen strawberries to the bottom of you pitcher, and cover with juice and sprite (in equal parts). Next, add your apple stars in on top of the strawberries. You’ll want to line them around the sides of the pitcher so you can see them as a middle layer. Next, fill it up with more juice and sprite. Add frozen blueberries on top as a floating layer, and serve! 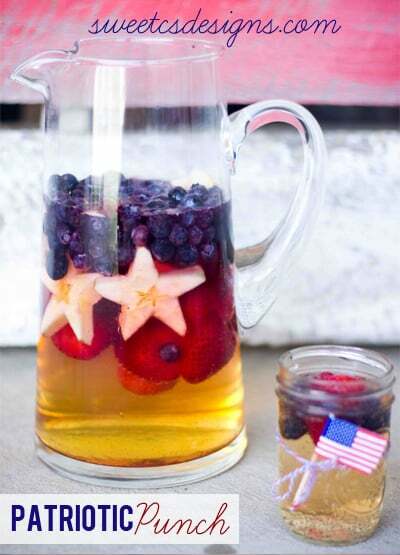 I like to serve this fun and patriotic 4th of July Fruit Punch in little mason jars with a simple piece of twine around it- and tuck a little flag toothpick in the twine. So adorable, and you can get the jars ready ahead of your party, then encourage guests to pour their own! 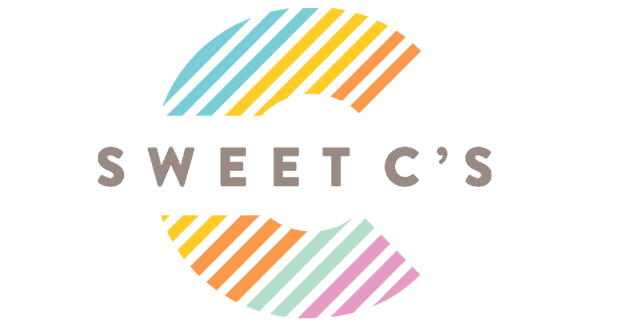 I like to put this punch in a large pitcher, punchbowl, or glass drink dispenser so guests can see all of the fruit – especially those adorable apple stars! -2 apples, sliced into 1 1/2" thick rounds. 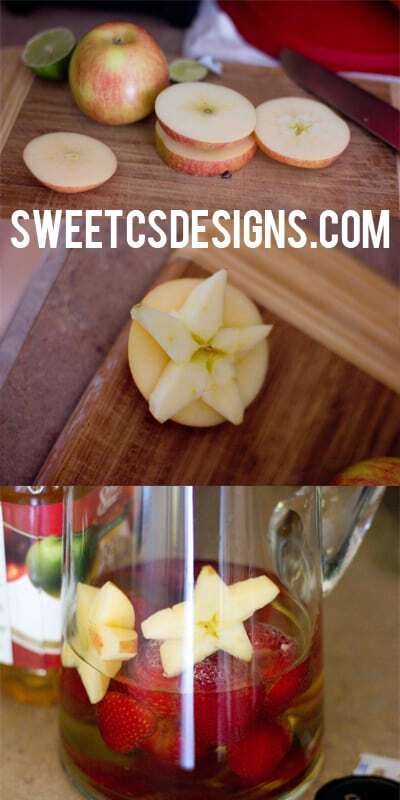 Start off by cutting star shapes into your apples. I freehanded star shapes using a knife blade and just softly scoured the surface of the apple to make a rough star shape, then cut it out and used it as a "stencil" to cut more stars- but if you have a star shaped cookie cutter, that would save you a lot of time. (Sadly all mine were too big!!). Next, add your apple stars in on top of the strawberries. You'll want to line them around the sides of the pitcher so you can see them as a middle layer. To make this an adult version, add a bottle of wine, or some tequila, vodka or rum. Just be warned- fruit soaks up alcohol. Don't go eating tons of fruit! What’s your favorite summer punch? Or your favorite Red, White and Blue treat? Fun! Another way I can use starfruit! Love this recipe I can’t wait to try it. This will b a hit at church. Love the punch idea! I just posted cute DIY 4th of July flip flops that I made! So pretty, love the apple stars!